Business meals are more than just talking shop. They are a way to distinguish your demeanor from the dinner table to the boardroom. You can be the best in your field or tops in your company, but if you mess up the business meal, no one is going to be impressed. What do you need to know about modern table manners to make a great impression? Here are seven business dining tips to present yourself in the best manner possible and ace every business dining experience that crosses your path. 1) Invitations- Remember that the person extending the invitation is the host and is responsible for payment of the bill. When receiving or extending invitations, pay attention to special dietary needs. The host may ask about food allergies or sensitivities, kosher, halal, gluten-free, sugar-free and dairy-free diets. Be sure to RSVP or reply within 24 hours with any dietary restrictions. 2) Guest Duties– As a guest, observe the host for cues. 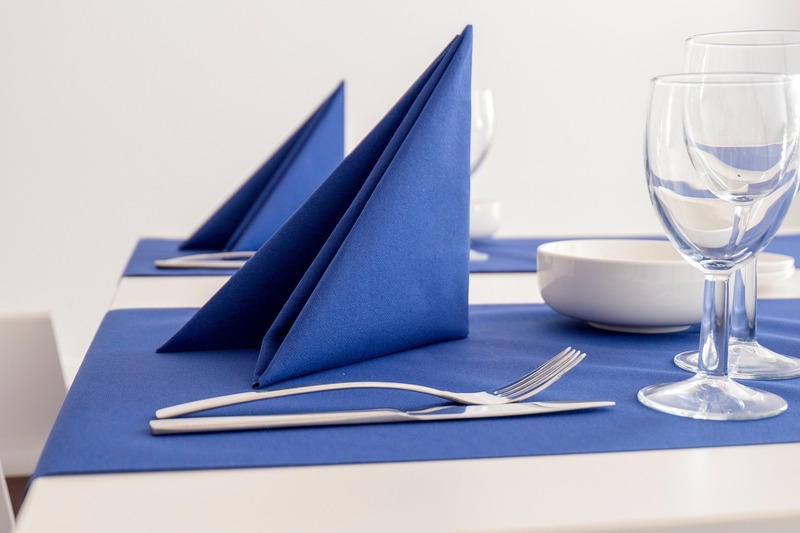 For example: place your napkin in your lap after the host; the host does so first to signal the start of the meal. When excusing yourself between courses, the napkin is placed on the chair seat soiled side down. 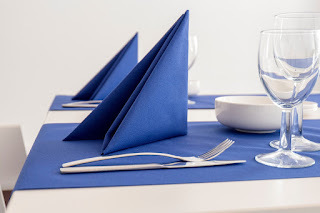 At meal’s end, place your loosely folded napkin on the left of your plate after the host does. Don’t refold it. 3) Silverware & Service Signals – Once silverware is used, including handles, it doesn’t touch the table again. Rest forks, knives and spoons on the side of your plate. Unused silverware stays on the table. If you are resting between bites, place your fork, with tines up, near the top of your plate. To signal the server that you’re finished, place your fork and knife across the center of the plate at the 5 o’clock position. Service signals also include closing your menu to indicate you’re ready to order. If you are browsing an open menu, the server has the impression you aren’t ready. 4) What should you order? Ask the person who invited you (host or hostess) for suggestions on the menu. Ask them to make suggestions or for their favorite dish. Listen carefully because they will provide a top and bottom price range based on the entrées they recommend. Then select a moderately priced item or one of the dishes they recommend. 5) To drink or not to drink? If the host orders alcohol, and you don’t wish to drink, you simply order the beverage of your preference without an explanation. “I’ll have an iced tea with lemon please” or “Diet Coke please” and continue to browse the menu. You are under no obligation to consume alcohol at lunch or any other time of the day. Polite dining companions will not comment or ask questions. If they do, simply ask, “Pardon me?” and look at them intently. They will realize the impertinence of their question. 7) Tipping – The host is the person who extended the invitation, and they are responsible for paying the bill. Consider these U.S. tipping guidelines: bartender: 10-20 % of bar bill, valet: $2.00-$5.00, coat check: $1.00 per coat, server: 15-20% of bill; 25% extraordinary service, sommelier: 15% of wine bill. The tip should reflect the total price of the bill before coupons, discounts, or gift certificates.